Evesham Township municipal offices are located at 984 Tuckerton Road, Marlton NJ 08053; phone: 856-983-2900. Photo: Evens-Cooper House, ca. 1800, South Elmwood Road, Evesham Township, NJ. Listed on the National Register of Historic Places in 1993. Photographed by User:Apc106 (own work), 2012, [cc-by-3.0 (creativecommons.org/licenses/by/3.0)], via Wikimedia Commons, accessed August, 2015. The Historic Resources of Evesham Township was listed on the National Register of Historic Places in 1990. Portions of the content of this web page, were adapted from a copy of the original nomination document. Adaptation copyright © 2010, The Gombach Group. Evesham Township , part of Burlington County, New Jersey, was established in 1688. At that time, the township included all of Mt. Laurel and Medford Townships and parts of Lumberton, Hainesport and Shamong Townships. Medford Township was partitioned from Evesham in 1847, Lumberton in 1860 and Mt. Laurel in 1872. Today, it is bounded on the east by Medford Township, south and southwest by Camden County, and on the north by Mt. Laurel Township. The geography of the township has always differed substantially from south to north; the southern portion, part of the pinelands, has remained largely covered with pines and oaks due to the earth of gravelly loam while the northern area, with arable soil, has been introduced to agriculture, commerce, industry and substantial residential development. The northern part of Evesham continues to grow, linked closely to transportation routes to New York and Philadelphia. The geographical boundaries of this multiple property nomination are those of Evesham's Township current (1989) municipal limits. A full account of Evesham's history begins in 1664, although its first documented settlement dates to 1684 and its official year of establishment is 1688. From 1664 to 1674, Sir George Carteret and Sir John Berkeley held the entire province of New Jersey, having been given the land and the right to govern it by the Duke of York. During Berkeley and Carteret's ten-year partnership, however, no settlers from Great Britain or elsewhere came to New Jersey. In 1674, John Berkeley sold his half interest in the undivided province of New Jersey to John Fenwick and Edward Byllynge, both Quakers of Great Britain. This sale of land led directly to the English colonization of West Jersey just a few years before the founding of Pennsylvania. Fenwick and Byllynge, soon in financial stress, turned over the rights of sale for their lands to a group of trustees or proprietors including William Penn, also a Quaker. From August 1676 until August 1677, the West Jersey Proprietors sought to bring settlers to the area. They advertised by promotional tracts particularly directed to the Society of Friends. The first of these tracts was authored by William Penn, and by 1683, the vast majority of land in West Jersey had been sold to Quaker merchants and merchant craftsmen of English origins. The first man to purchase lands in Evesham Township from the West Jersey Proprietors was Thomas Eves, also a Quaker. However, it cannot be proven that he lived on his land in Evesham. By 1684, two other Quaker families, the Heulings and the Ballingers, had purchased adjoining tracts in Evesham, and were know to have been residing on and farming their land, thus the terminus post quem of the historic context. Another family, William and Elizabeth Evans, also emigrated to New Jersey from Wales in 1685. A deed record from 1688 shows Evans obtaining 300 acres of land in Evesham at a place called Mt. Pray,  and in 1694, the first Friends meeting in Mt. Laurel was held in the Evans home. Shortly thereafter, in 1698, the first Meeting House was built at Mt. Laurel. William Evans, who had settled in Evesham in 1685, left the majority of his land to his sons, John and Thomas, in 1728. Prior to his death in 1717, Evans had conveyed land to trustees appointed for the Monthly Meeting of Friends for the use of the Quakers at Evesham and for a place to bury their dead. John remained at Mt. Laurel while Thomas settled in what is now known as Marlton. Thomas purchased a tract of one thousand acres about two miles east of Evesham from Margaret Cook of Philadelphia. In 1701, to eliminate any potential dispute with the Indians over the title of this land, Thomas drew up a deed which was signed by King Himolin, the Indian Chief. He exchanged five pounds for his land. Thomas Evans served as a minister of the Friends meeting and maintained an active farm until his death in 1783. Another early Quaker family to settle in Evesham Township was the Wills. Dr. Daniel Wills came to New Jersey from England in 1677 aboard the "Kent". He located 600 acres in Northampton Township, Burlington County. His grandson, James, founder of the Wills' homestead in Evesham, bought 1,888 acres from Michael Wanton in 1737 . He soon sold off portions of that tract to James Lippincott and his own son, Micajah. Micajah, along with William Heulings, Thomas Evans, Thomas Eves, Samuel and Daniel Lippincott, Amos Haines, William Troth, Thomas Venable, Isaac Borton and Henry Ballinger, were among the early settlers in Evesham, bringing mills, farming and other industries to the area. However, in the late 1700s to early 1800s, the improvement of road systems and construction of religious buildings and commercial establishments reflect Evesham's significant growth from its agricultural beginnings. It is known that prior to the 1760s, two main Indian trails were used as roads crossing the township, one from Cooper's Point through Marlton to Barnegat Bay, known as the Manahawkin Trail, and the other from Mount Holly down to the Mullica River. The Manahawkin Trail, which was to become Main Street in Marlton, was the boundary between two Quaker family plantations, the Inskips and the Eves. In 1758, the Inskips opened a general store along the Manahawkin. A surviving ledger of the store's activities evidences that the store sold a variety of merchandise and functioned as a post office. A road survey shows the trail was upgraded in 1764 and at this time a school, sold in the 1770s, was in existence along its route. On this same road, John Hammitt built the first inn in Evesham around 1780. The inn was to become the first official post office in 1808 earning Evesham the name of "Evesham Post Town." Around the store and inn, a village of services, later known as Marlton, developed. It was the Quakers' charge to foster the growth of such villages and thus aid the settlement of the land in the township. The Quakers had hoped that in settling a territory they would then be able to own and govern its lands. The Quakers, though unsuccessful at obtaining the rights to govern, did in fact influence much of the town development in New Jersey. In 1745, they comprised 50.79% of Burlington county's white population. Marlton was a successful endeavor, while other villages such as Greentree, started by Thomas Eves in the 1770s, failed to survive. In 1796, another road survey was taken to open up a new road directly to Camden from Marlton. The new road was proposed at the same time that Evesham's growth of small communities such as Marlton, Cropwell, and Medford was taking place. As Evesham developed, the Quaker influence of the founding families became increasingly more visible. Not only did physical improvements such as churches and schools became abundant, but also apparent was the tolerance of other religions and the acceptance of runaway slaves. In addition, the government was administered by Quakers. The majority of the Quaker families intermarried and maintained similar lifestyles on farms. Self-sufficiency was the primary focus of the farmers' occupations, with surplus products being sold at Philadelphia markets. Although Evesham was predominantly agricultural until after the 1820s, the Quakers attempted to invite tradesmen to the area to establish their crafts. A Friends meeting was organized in Cropwell around 1760; the present meeting house was constructed in 1809. Prior to the construction of their meeting house, the Friends erected a school in 1785. Another school, known as the Pine Grove School, was organized in 1792, also by the Friends of the Cropwell Meeting. Meanwhile, in Marlton, the township's principal village, a Baptist Meeting House was built in 1805. The Evesham Baptist Church was eventually recognized and the Marlton Methodist Episcopal Church was established. The discovery of marl in the village in the early 1800s led to the naming of "Marlton", which is said to have been laid out as a town in 1814. However, deed research indicates that land was not sold off in smaller lots until the, 1820s and '30s. During that time, a descendant of Joseph Eves, Joseph E. Venecomb, and Isaac Stokes subdivided and sold the land on East and West Main Streets. Records show that taxes were being collected as early as 1810 in the township. The year 1810 is used as the end date of the historic context because it approximates Evesham's entry into a period of agricultural expansion augmented by the discovery of marl, increased immigration, and commercial growth. Following the early 1800s Evesham Township continued to grow, with institutions such as the London Grove School, built in 1820. By 1830 Evesham Township was found to have eight villages: Evesham, Medford, Colestown, Lumberton, Fostertown, Evesham Cross Roads, Bodine (assumed to be centered around the Bodine Tavern) and Cropwell (assumed to be centered around the Cropwell Meeting House), inhabited by a population of 4,239. Of these eight villages, Evesham, Bodine, and Cropwell are within the current Evesham Township municipal boundaries. Stores, saw mills, grist mills, fulling mills, and cider distilleries were listed as industries and Evesham and Medford as post office towns. The Evesham Post Town became known as "Marlton" in 1845. The mid- to late-nineteenth century also saw the development of Evesham Township with additional villages such as Milford (now Kresson) around 1846 and Evesboro. At the same time that the villages of Evesham Township were expanding with industries and institutions, the agricultural base of the township remained prosperous due to fertile lands and available marl. The advent of the railroad in 1881 through the northern part of Evesham rapidly changed this area, opening up the agricultural base of the community to other industries. Today, in spite of late-nineteenth-and twentieth-century developments and the severe reduction of the cultivated lands in Evesham, the township retains many remnants of its beginnings. The crossroads that mark the centers of the nineteenth-century villages are still existent and several of the eighteenth-and nineteenth-century farmhouses that reflect the agricultural base of the northern part of the township remain, although typically without the outbuildings and on smaller tracts of land. Among these farmhouses, examples such as the Jacob Wills, Thomas Eves, and various Evans family houses, continue to convey the architecture and history of early settlement and development in Evesham. Charles H. Ashton, "The Domestic Architecture of Burlington County. New Jersey: 1677-1840," Master's Thesis, Columbia University, 1976, p. 14. William R. Lippincott, Traditions of Old Evesham Township (Reprinted from the Moorestown Republican, 1911), p. 5. Major E.M. Woodward, History of Burlington County. New Jersey (Philadelphia: Everts and Peck, 1883), p. 316. Historical accounts differ on James' relationship to Dr. Daniel Wills. He has been recorded as both Dr. Wills' son and grandson. Peter 0.Wacker, Land and People: A Cultural Geography of Pre-Industrial New Jersey: Origins and Settlement Patterns (New Brunswick, New Jersey: Rutgers University Press, 1975), p. 178. Thomas F. Gordon, The History of New Jersey (Trenton: Daniel Fenton, 1834), p. 140. As evidenced by the Flemish bond brick houses, the early domestic architecture of Evesham Township represents the Delaware Valley vernacular tradition, documenting this southern New Jersey area's cultural link to the Philadelphia region. In its long-standing adherence to the basic Georgian house form, Evesham's domestic architecture also gives the township a characteristic architectural vocabulary, one rooted in the inherent conservatism of rural communities. 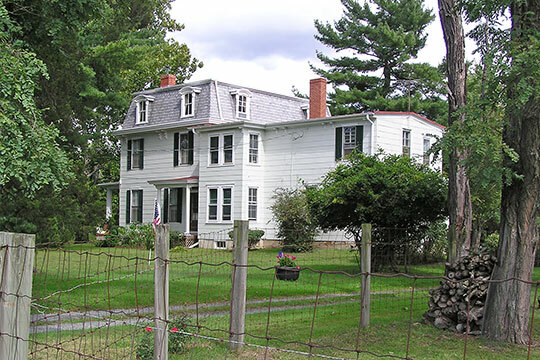 The township's oldest known dwelling to survive is the 1776 Thomas Eves House, although historical accounts point to William Evans' house being erected at least by 1694 and to the Heuling and Ballinger families establishing residences by 1684. Flemish bond brick with glazed headers or "checkerboard" was used in several of Evesham's quality houses, particularly those erected prior to 1800, after which no known examples have been identified in Evesham or elsewhere in Burlington County. The tradition for this brickwork was brought to the Delaware Valley by the English and Welsh settlers, many of whom were Quakers immigrating to America to escape religious persecution in the late seventeenth and eighteenth centuries. Whereas northern New Jersey was largely settled and influenced by the Dutch, southern New Jersey or West Jersey was shaped by those who followed William Penn's arrival. Their influence is seen in several of the southern New Jersey counties as well as Philadelphia and northern Delaware in the characteristic Flemish bond, patterned and/or "checkerboard" brickwork as well as the use of initialed gabled end walls, string-courses, and pents. While the decorative brickwork was one form of this Delaware Valley tradition, brick construction as a whole was prevalent in the early period of Evesham Township and is what survives most from the eighteenth-century period. The brick building tradition was brought to the West Jersey colony by English Quakers who had witnessed the rebuilding of London after the Great Fire of 1666. Stone construction throughout the township's history was rare; frame construction was not to be common until the second quarter of the nineteenth century. The conservative character of Evesham's domestic architecture was established in the eighteenth century when house plans were designed in the Georgian mode, following patterns in England. These patterns, prevalent among London's middle class housing after the 1660s, typically included a conventional fireplace in the more formal front room, a corner fireplace (also of Swedish influence) in the rear room, and a side stairhall. "This London house type was, in all probability, one of the main factors which influenced the buildings of the settlers in the Burlington County area, including Philadelphia." Based upon surveys of countywide documentation,  which offer comparables for analysis of Evesham's resources, variations of the plan existed. One such variation is in the positioning of fireplaces, many being back to back in corners or built into corners of back rooms. A rarity in the county is the 1789 Jacob Wills House, the back to back corner fireplaces of which are located along an interior wall, rather than a party wall. This configuration gives the house its interior chimney which is typical of the post-Revolutionary War period. Whether two-room, center hall, 2/3 side hall, or corner passage plans, this basic form was to dominate Evesham's housing throughout the nineteenth century, challenged only minimally by the late-nineteenth-century Queen Anne that was to radically redefine house plans in other more urban communities throughout the nation. The Evesham houses known from the period of early settlement and development were usually double-pile plans (two rooms deep) in both the center hall and side hall arrangements. In a modest gesture to style, these early dwellings and those later modeled after the traditional Georgian house form were embellished with fashionable frontispieces, sash, and machine-made trim. The pre-1810 houses were also updated stylistically with stucco and applied architectural elements. However, the eighteenth-century prototype persisted. There are a few select examples of handsome Italianate and Second Empire houses erected in the second half of the nineteenth century, many of frame construction. As Evesham's families grew and prospered, dwellings were often enlarged rather than built anew. Most commonly, Georgian and Federal houses – of subtle distinction in their vernacular adaptations – were expanded with side wings. Some were of clearly disparate construction such as the smaller, frame wing to the Jacob Wills House, while others attempted to blend wings with flush facades and level cornice lines, as seen in the Heulings House. There are also examples of Georgian-Federal dwellings being enlarged in the Victorian era, including the Inskip Farm and the David Evans House. The dwellings of Evesham are typically two to three stories in height and three to five registers wide. The township is not one of mansions, but one of modest-sized village residences and farmhouses. While the village buildings generally retain their settings in clusters, the agricultural properties, upon which the landmarks of early settlement and development generally are found, have witnessed more alterations to their settings. This relationship with the environment has changed from the suburban growth of the community and the drastic decrease in agricultural activity which has also resulted in the loss of most outbuildings. Charles H. Ashton, "The Domestic Architecture of Burlington County, New Jersey: 1677-1840,'' Masters Thesis, Columbia University, 1976, p. 45. Dwellings in Evesham are typically two to three stories in height and three to five registers in width with regular fenestration. The survival rate of original porches and/or pents is very low, and period outbuildings are a rarity. Without the availability of sufficient interior survey data, the distribution of building plans (two-room versus Georgian variations) and fireplace types (conventional versus corner) cannot be ascertained. However, existing knowledge of the architectural resources of neighboring areas of settlement suggests that variations and combinations of floor plans and fireplace configurations are the norm rather than a set building form. One generalization that appears to hold, with exceptions such as the 1789 Jacob Wills House, is the location of chimneys along end walls rather than interior walls. This observation is in keeping with pre-Revolutionary War building practices. The dwellings of Evesham Township reflect a wide range of styles as do those of surrounding communities. These styles include the Delaware Valley vernacular, Georgian, Federal, Greek Revival, Italianate, and Second Empire. While this variety of styles exists, the most prevalent influence on Evesham's domestic architecture throughout the nineteenth century is the traditional Georgian house form, the vocabulary for which was established in Evesham during the eighteenth century. This form, along with the tradition of patterned brickwork, prevalent until circa 1800, are the most character defining features of Evesham's dwellings between 1684 and 1810. Acroterion. Cultural Resources Survey of Evesham Township. Prepared for the Township of Evesham, New Jersey: 1985. Ashton, Charles H. "The Domestic Architecture of Burlington County, New Jersey: 1677-1840." Masters Thesis, Columbia University, 1976. Burlington County Herald. Mount Holly, New Jersey. November 21 and 28, 1974. Burlington County Times. Burlington County, New Jersey. Sunday, February 27, 1983. DeCou, George. Early History of Burlington County. The First Settlement. 1933. 1826-1916 The Mount Holly Herald: Historical and Industrial Edition. Mount Holly, New Jersey: July 1,1916. Evesham Township Bicentennial Committee. Yesterday's Evesham Township. Evesham, New Jersey: 1986. Evesham Township Historic Preservation Commission. Historic Village of Marlton Walking Tour and Historic Evesham Motor Tour. 1988. Gordon, Thomas F. The History of New Jersey. Trenton: Daniel Fenton, 1834. Griscom, Lloyd E. The Historic County of Burlington. Mt. Holly, New Jersey: Burlington County Cultural and Heritage Commission, 1973. Interview with Edna H. Wirth, Township Historian, February 2, 1989. Lippincott, William p.Traditions of Old Evesham Township. Reprinted from the Moorestown Republican. 1911. Lyght, Ernest. Path of Freedom; The Black Presence in New Jersey's Burlington County 1659-1900. Cherry Hill, New Jersey: E.&E. Printing House, 1978. Parry, William, George Sykes and F.W. Earl. New Man of Burlington County. R.K. Kuhn and J.D. Janney, 1858. Pomfret, John E. The Province of West New Jersey 1609-1702. 1956. Reprint. Princeton, New Jersey: Princeton University Press, 1976. Scott, J.D. Combination Atlas Map of Burlington County. New Jersey. 1876. Wacker, Peter O. Land and People. New Brunswick, New Jersey: Rutgers University Press, 1975. Wirth, Edna. The British Encampment of Evesham Township. 1987. Woodward, Major E.M. History of Burlington County, New Jersey. Philadelphia: Everts and Peck, 1883.